My 4th grade son was given a choice in his Missions studies: write a report on his assigned Mission, or create a Mission model. Any guesses as to what he chose – the boring report or the totally awesome model? If you guessed model, ding ding ding! You’d be correct. His reasoning was that he would have to study a whole bunch to create a report on his Mission, and it would be a whole lot more work. But he didn’t have to know anything about the Mission to create a replica of the building. So to him, creating a model would be a piece of cake. Except that his mom is probably the uncraftiest person in the world. I’m looking at this Missions project like my own personal albatross. Sure, it’s supposed to be his project. But as any parent of a 4th grader being faced with a huge project like this knows, this is really a project for parents. We will be the ones creating the timeline for getting this project together in the correct amount of time so that it can look fabulous and be finished by the due date. We will be the ones motivating our kids to get off their duffs and work on the project. We will be the ones carting them to and from the arts and crafts stores, wiping the bakery section out of toothpicks, calling every single store in the area to find out whether they have miniature bells and anything that closely resembles tiny trees or bushes to make it look more real, and tearing our hair out at the 11th hour as we realize the paint just isn’t drying and we still need to add embellishments…. And I haven’t even talked about the unspoken competition regarding whose Mission looks the best, and whose will be ending up in the trash after the teacher has given it a mercy grade for, ahem, effort. Oh, and have I mentioned my uncraftiness? 1. 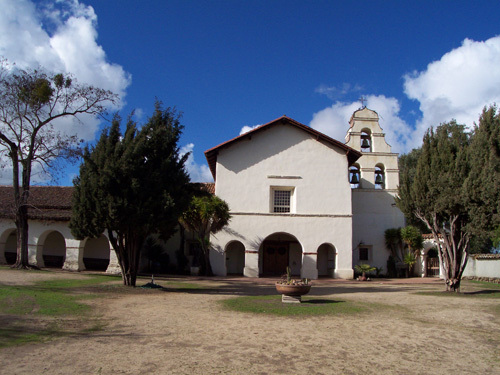 Checked a book out of the library on San Juan Bautista, complete with details on the Mission, as well as instructions for how to create a Mission model. I thumbed through the book (today), and the directions actually look easy enough. In fact, I felt pretty confident that I could actually guide my son through this project. And then I checked out the reviews online. Apparently the dimensions given don’t allow any of the building sides to fit together. Sweet. So it’s back to the drawing board…..
Let me remind you how much I love projects like these. We will be starting this albatross tonight, correct dimensions or not, using cardboard, paint with sand, toothpicks, hairplugs to replace the hair I tear out, and a lot of luck. Anyone else tackling this project, or have gone through the pain of Mission building with a past 4th grader? Share your horror and success stories here so I have something to read while I, mean we, procrastinate work on this project. It’s totally cheating. It even states it in the rules. But there are a few other options out there…. It’s been suggested we try a gingerbread house – which might be kind of cool if I can keep my cat from devouring it, as well as keep the ants at bay. The mission models may be totally cheating but they sell them along with all of the accessories (bells, trees etc.) at Michael’s Arts & Crafts and a lot of parents purchase them. My daughter did San Juan capistrano where the domed chapel was destroyed in an earthquake and never rebuilt. We did the post-earthquake version with some low walls and a pile of rubble! She got full credit and I got off easy. Good luck.